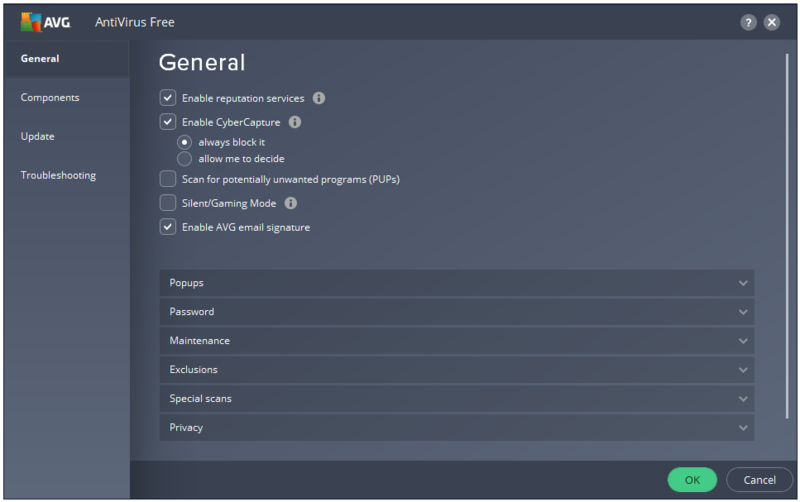 Home » PC » Antivirus & Security » AVG AntiVirus Free 2019 Review – Essential Lightweight Protection for Windows 10. 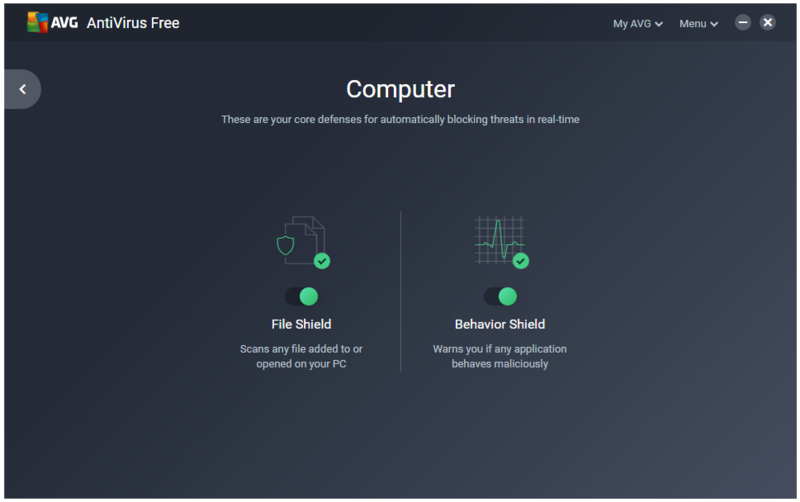 Best Free Antivirus Products for Windows PC in 2019 – AVG AntiVirus Free. 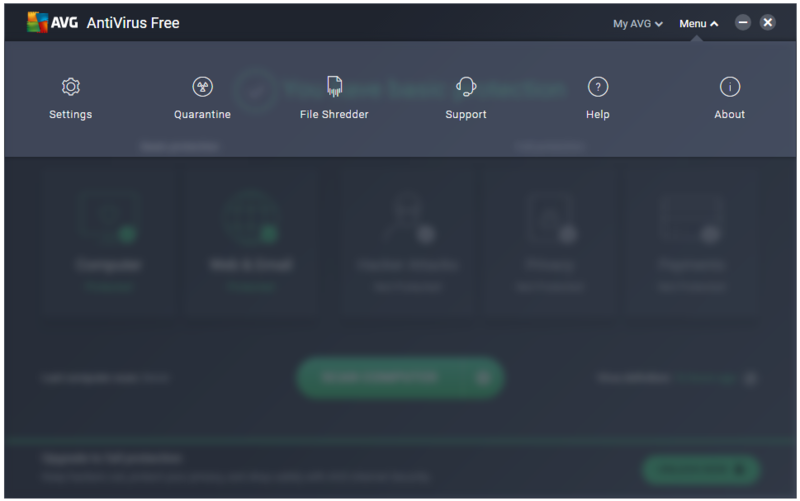 AVG AntiVirus Free provides protection from virus, spyware, and other types of malware using their famous antivirus engine. You get web and email protection as well bundled into your antivirus. 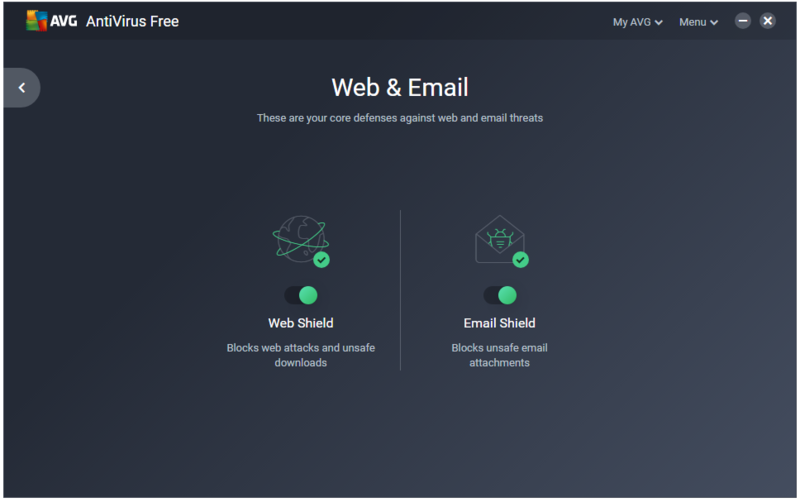 AVG blocks unsafe web links, downloads, and email attachments. AVG AntiVirus Free includes their powerful Behaviour Shield, which detects the new and unknown malware. Since the acquisition of AVG by Avast, the signatures of both of the companies have been merged. The merger of signatures has made the detection ratio of AVG even better. 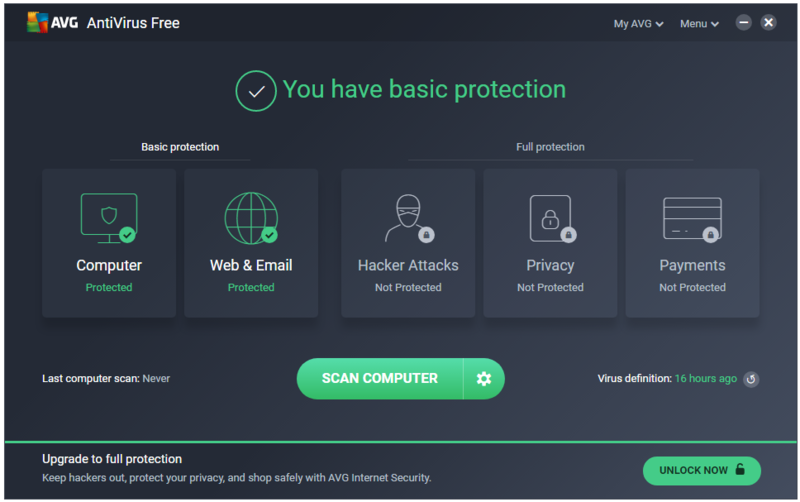 Along with all of their technologies, AVG now also includes Avast’s CyberCapture technology, which is a Cloud malware scanner engine. The dedicated Ransomware Protection component is not available in the Free version. In the December 2018 report of VB100, AVG Passed the VB100 test. AVG is a winner of the AV-Comparatives Advanced+ award. The Computer protection includes the following two shields. The Web & Email protection includes the following two shields. The My AVG menu bar opens the programs offered by AVG that are installed on your computer. The Menu titled menu bar is the one that displays the features of AVG AntiVirus. The Menu bar has links to important antivirus sections. 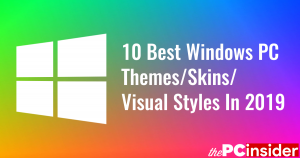 The Settings windows has four side tabs that include all of the Settings available in the AVG AntiVirus program. The Quarantine section stores the detected malware. You can perform additional actions on these detected files. 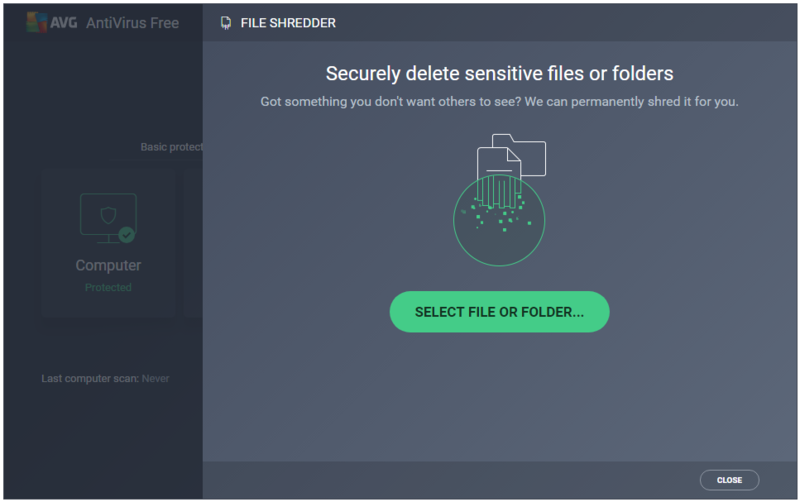 The File Shredder is a secure wipe tool that AVG has always provided to its free users. Even now, it remains an integral part of their free AntiVirus. 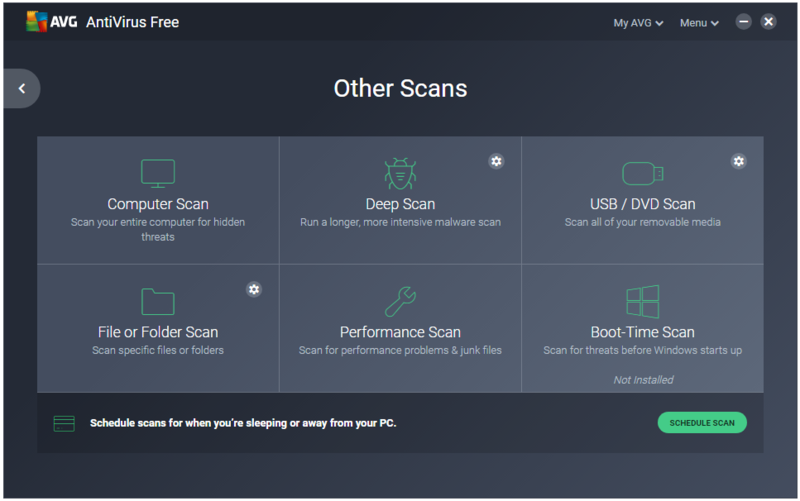 AVG provides the most types of Scans in a free antivirus software. You get six scan options – Computer Scan, Deep Scan, USB/DVD Scan, File or Folder Scan, Performance Scan, Boot-Time Scan. The automatic Removable Media Scan is still missing. Hard Disk Used: The installer is around 250 MB in size. After installation and an update, the AVG AntiVirus Free uses around 1.50 GB of the disk space. CPU and RAM Usage When Idle: AVG is light on system resources. It uses only about 40 MB of RAM when it is idle. The CPU usage is stable at 0%. 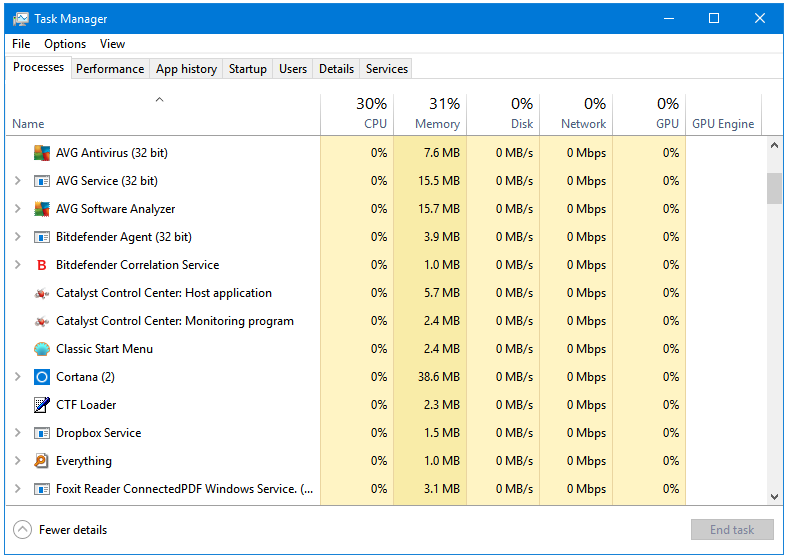 CPU and RAM Usage When Scanning: Even you are performing Full scan with AVG, it only uses around 50 MB of your RAM. The CPU usage is also very low; it fluctuates between 2 to 8%, and is stable at around 5% for most of the time it is scanning. AVG has a nice dark theme that does not look out of place on Windows 10. All of their settings are properly categorized into four side tabs. All of the features can be easily accessed. The main window has a permanent bar at the bottom that reminds you to upgrade to the full protection by unlocking all of the features of the AVG AntiVirus. 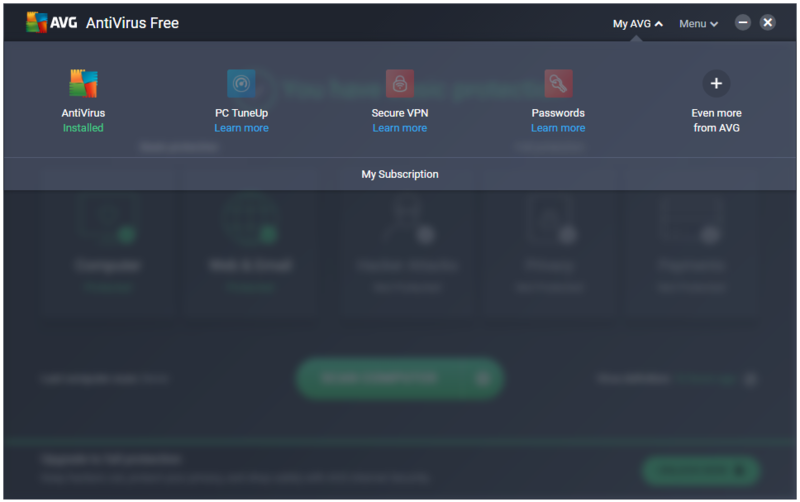 Out of the five sections listed on the home screen, three are promotions for features that are available only in the paid version of this program. The My AVG menu bar lists four programs by AVG, out of which three are paid. Another mention of their paid products.